It’s once again time for our weekly update. Today we are updating you about the latest development status & more. Today, our factory has restarted and most of the engineers and workers returned. This week, we expect to reach a lot more clarity on the issues that we faced before the Chinese New Year. During Chinese New Year we continued a lot of tests with the Ockel Sirius A and Sirius A Pro production units. Currently we’re evaluating the test results, which will give us a better understanding about the unexpected shut downs, we told you about earlier. A meeting with Intel has been scheduled this week to further discuss the results of the tests and possible resolutions. In the meantime we will continue with the extensive test runs for all of the produced Ockel Sirius A & Sirius A Pro’s. As soon as we have a clear understanding of the situation, we will re-work (where applicable) and finalize with the production process. Our goal is to give you an in-depth update next week, or if everything is clear soon enough, we might give you an additional update this week. We hope to present you with a detailed roll-out plan as soon as possible. Thanks all, for your patience and trust. The other news that we wanted to share with you is that our sales activities together with our backers from Indiegogo resulted in a complete sell-out of the first production. Naturally we intend to produce more units to fulfill existing and future demands. Nevertheless it is an important milestone for us! Naturally, future backers will have to wait a bit longer than you, all the backers of the first hour (&batch). We cannot thank you enough for your support and trust! We are always tweaking & updating our marketing materials. Last week, we received the hard copy brochure with our Ockel Computers product line-up, including the accessories. 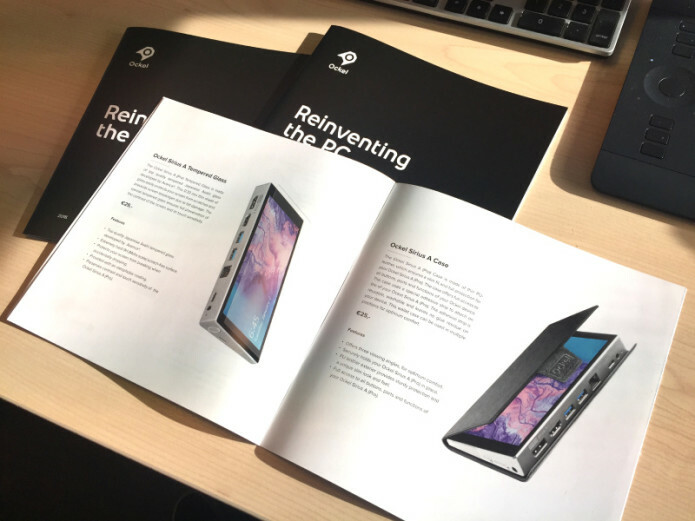 It’s a fantastic brochure and obviously entirely designed by our own team. The brochure will be handed out on events and meetings with potential partners. We reached an amazing milestone together! Don't miss this: The first Ockel update of 2019!